Actor Sivakarthikeyan-starrer Tamil actioner "Kaaki Sattai" has netted Rs.15.58 crore in first four days since its release in Tamil Nadu. 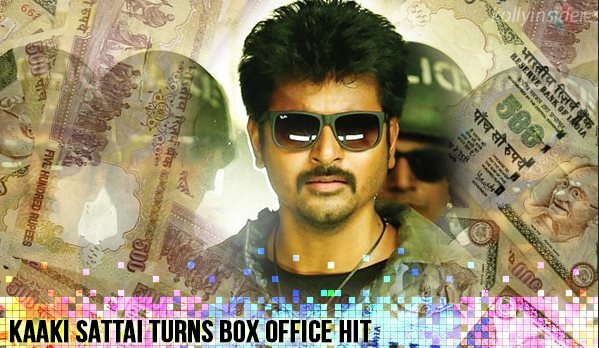 "The film registered the biggest opening in Siva Karthikeyan's career. It has collected Rs.15.58 crore till Monday since its release. It's turning out to be a highly profitable venture and fourth hit for Siva in a row," trade analyst Trinath told. Siva's last three hits include "Kedi Billa Killadi Ranga", "Ethir Neechal" and "Maan Karate". Directed by Durai Senthil Kumar, "Kaaki Sattai" is the story of a police constable who has the urge to be an honest cop unlike the usual corrupt officers in his department. The film is seen as a major step stone in Siva's career as his character is portrayed as someone who has a good deal of heroism. The actor was much appreciated for his performance and for making sure that his antics and appearance was not over the top. "Kakki Sattai" has Sri Divya as lead actress and other cast include Vijay Raaz, Nagineedu, Prabhu, Manobala, Vidyullekha Raman, Imman Annachi, Kalpana, Nagineedu, Mayilsamy and the film is produced by actor Dhanush.